Chile - Atacama and back to Argentina after 10 years!! The border between Bolivia and Chile isnt really anything apart from 2 flags and a place where the road begins, the 4x4s turn back to the desert and the minibuses pick you up to take you to the oasis of Atacama. Not a passport check in sight - that all happens after you get to the town. Its a pleasant place with a lovely climate compared to the harshness of the high Andean climes we have been in for the past few weeks. Warm in the evening, dry, altogether nice. We queued the border formalities and the bus dropped us off in town and we noticed the difference immediately. For starters everything was about 3 times as expensive as anywhere we had been to yet, but it was clearly a civilised place. There were cute restaurants with things like salmon on the menu, rather than offal. Cars, less than 10 years old. People cycling mountain bikes. We had literally arrived in a different country. We got a hostel and headed off looking for the next priority, a ticket to Salta across the other border in Argentina and we son discovered that we were bloody stranded again. No buses until Tuesday (6 days), which was 4 days longer than we wanted to spend in Chile as the plan is to head west across the entire continent to Rio de Janeiro before heading too far south again. Shite!! We tried all the options and bus companies, but to no avail. A few chats with other people in our hostel confirmed that lots of people were in the same situation and we did not want to spend, financially or temporally any more in Chile than necessary, despite the fact that it is a nice place. The American girls from the Salar trip had to be in Buenos Aires by the 12, in 6 days, so we were all vying for the same tickets out of Chile. Options: Hire a car, not possible across borders. Rent a taxi, again, we would have to arrange a pick up at the uninhabited border - not advisable. 24 hours bus to Santiago and then another one to Bs As. Not on your nellie. A French chap called David gave us a suggestion to head up to the border post to meet a bus coming from Peru (hopefully not via Cusco q.v. !!) and going on to Salta. They might let us on before 8am, when the border opens. And so we tried it out, it was better than just sitting around and doing nothing. We were there by about 7.30 and the bus was there! There was hope! Apparently Chilean transport law does not allow buses pick up or let people off unless the company has a permit and this company only had a permit to drive through Chile. NO!!!! But the driver, who to be fair was a lovely chap and very apologetic, gave us another suggestion that had not occurred to us. Ask a trucker for a lift. The Paraguayan dudes transporting cars would usually do it for a few bob/pesos/bucks. Lacking alternatives and keen to chalk down another mode of transport we decided to give it a shot. We wandered around the trucks who were also waiting for the border to open and a bald chap in shorts started waving at us. This could be the opportunity!! He said hop in and made sure there were only 2of us. He was Argentinean, which made me feel a little more comfortable. "How much then", I asked. "$70US each", he said. UUFFF!! The bus was only 40 each! "Bueno $50 each then" and each accepted. We stuck the rucksacks in and and after performing the Chilean exit formalities we were away by 08.30. Scania Truck, mode of transport number 18!! Thankfully he was empty so we made really good time, passing out the bus we had tried to get on within the hour and crossing the Argentine border before midday. I chatted away in Spanish but he didnt speak English so not much to entertain Claire. However there was a bed in the back where she was sitting so she took full advantage for the first few hours. Juan, the driver was from Salta and would leave us off in Jujuy, a few hours to the north. 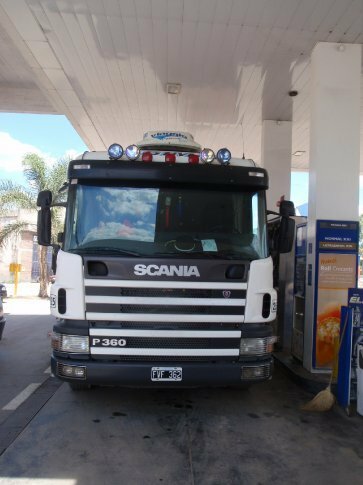 He was a bit of a wide boy though (as truckers are I guess) and started to talk about a few strange things, like the town of Sesques the first Argentine town after the barren border. He said that it was common for people to be strip searched there, especially those hitching in lorries. I consulted the guide books. No mention. HMM. We stopped in Sesques and he said he would get out and try and see if he knew anyone who would be able to let us through without such an unwelcoming beginning in country number 4. He came back and said he had bribed an official $20US to let us through. Not believing him, but again, lacking alternatives we could only go along with it. The journey continued through a lovelm, multicoloured gorge landscape without event and I started to look forward to getting back to Argentina after 10 years away. We coughed up the dough in Jujuy and we caught a bus on to Salta. We got a great deal in a nice hotel (private bath and tv!!) as a treat after so many days roughing it. And then on to the thing I had been looking forward to for .. well ... 10 years. Argentinian meat!! I will spare you the gory details but suffice to say they know how to cook beef. We had a lovely meal of Asado de Tiora dn Bife de Chorizo, Claire admitting it was the best steak she had ever had. We also bought Yerba mate (i´ll explain in more detail later) and Alfajores and a bottle of malbec and the return to Argentina was complete. I missed you Argentina!! We popped into a Casino seeing as we were dressed up in our only nice clothes and didnt win but didnt lose anything we werent happy to for free gin and tonics. Next day, we wandered around the handicraft markets and soaked up the familiar (for me) sights and sounds before having a siesta in the afternoon (as do the Salteños) Claire´s tummy started to feel a bit dodgy so it was a bit of a struggle for her when the american girls from the Salar tour called in at the hotel to say hi and recount the travel tales. They had taken a truck as well, but their driver didnt charge them and bought them lunch. there are sometimes advanteges to being a group of girls travelling alone! We drank mate in the square and had dinner together before picking up a few bits and bobs and heading home to watch a movie. Strage place to watch "in the name of the Father" but why not! We went to the Museum of the north the next day for a bit of Argentine war of independence culture and history and had another fabulous and dirt cheap meat fest for lunch. 10US for steak, ribs and sausage plus salad and roasties and bread for 2 people. We have arrived in meat heaven, and veggie hell! Meat diet helping Claire´s tum but still not the mae west. Then, on to the bus station to buy out tickets in advance (we´re learning from our mistakes) for the next leg of the journey, to Cafayete, home of some vineyards and then on to the far east of the country, Misiones. Bizarrely bumped into Katie and Kerry, the English girls who we´d met on the tour in Manu in the bus station, who needed to get to Rio in 3 days. Best of luck to them with that!! Que sepas que sigo tus aventuras !! !